The Opening Ceremony for the biggest Optimist World Championship ever with 280 competitors from 62 countries got underway with a parade. The Bermuda team of Christian Ebbin, Sebastian Kempe, Jack Hildebrand, Rian Geraghty-McDonnell and Jordan Etemadi got to go up on a large stage and get applauds from a pretty big crowd, with the announcer telling the crowd about Bermuda and how close t is the USA. The regatta start tomorrow and it is the biggest world championship in sailing during this year. 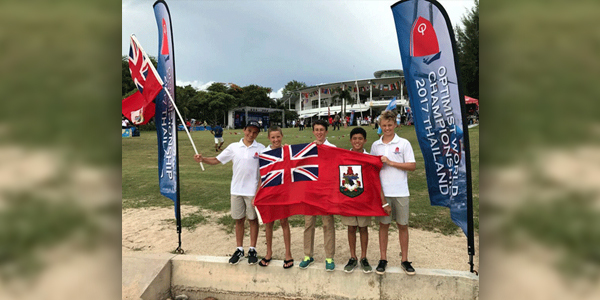 Congratulations to these young sailors representing Bermuda. I would love to know WHERE the Opti Worlds Regatta is being held? « Column: Will We Need Lawyers By 2050?